Right now, I’m making our Rosh Hashanah dinner. It’s a Jewish New Year that occurs every fall, usually in September or October. Traditionally, there is a large dinner with all your family and you spend most of the day cooking dinner. Since I don’t usually like to spend all day in the kitchen cooking dinner, and I’m all about the quick and easy meals, I found a way to whip up a delicious Rosh Hashanah recipe, with minimal effort. Quick and easy meals is where this Roasted Honey-Soy Glazed Chicken recipe comes into its own. It is incredibly easy, with just a handful of ingredients, but it is more than just a simple mouthful of flavors! It’s a little sweet, a little salty and a little smoky…it really doesn’t get better than this. Well, except that it’s that good and I don’t spend all day cooking it! While it’s traditional to have a large, festive dinner on Rosh Hashanah, we don’t have extended family that lives near us, so it’s just me, my husband and kids on the holiday. Even though we don’t have a lot of family to celebrate with, it’s still a special day for us with a special meal. There’s no point in spending hours making lots of elaborate dishes for just our family, but I still want the meal to be special and festive. It should be delicious, symbolic and special. That’s what makes this roasted chicken perfect. Since Rosh Hashanah is a new year, it’s traditional to celebrate with foods that are sweet, to bring a sweet and good new year. Honey is one of the traditional foods that we have at the table. And of course apple dipped in honey is always at the table. The soy sauce in this glaze is perfect to balance out the sweetness of the honey. It’s salty, rich flavor is perfect to give these chicken thighs a delicious flavor. The salt in the soy sauce also helps to really bring out the flavor and juices of the chicken. Even though you want a little salt, be sure to use low sodium, or reduced sodium soy sauce. The flavor will be different with regular soy sauce and the chicken will be much too salty. The garlic and sesame oil add a little more depth of flavor to the chicken. Chicken is a wonderfully mild meat that can be dressed up with a sauce, and the flavor of the meat compliments the flavor of the sauce, instead of competing with it. And don’t forget a little lime juice to help add a little citrus sweetness to the sauce. While this chicken is quick and easy, it’s important to remember to marinate it overnight. You may have heard that the best chicken is brined before it’s cooked. The brining process (essentially soaking in salt water) helps keep the chicken juicy during the cooking process. Though this chicken isn’t brined with the usual salt water, the salty soy sauce acts the same way to help keep this chicken nice and moist while it’s cooking. Be sure to baste the chicken with the juices from the pan a couple of times during cooking so the chicken doesn’t get too dry and crispy on the top. We love to have this for Rosh Hashanah, but if you don’t celebrate – no worries! This delicious Roasted Honey-Soy Glazed Chicken is perfect for any day of the week. It’s easy and versatile. We serve it with traditional challah bread, but you can also serve it with steamed rice or just simply your favorite veggies! L’Shana Tova! NEED MORE ROSH HASHANAH RECIPES? Only a handful of ingredients, and easy to prepare, this dish is sure to become a regular feature on your weekly menu. 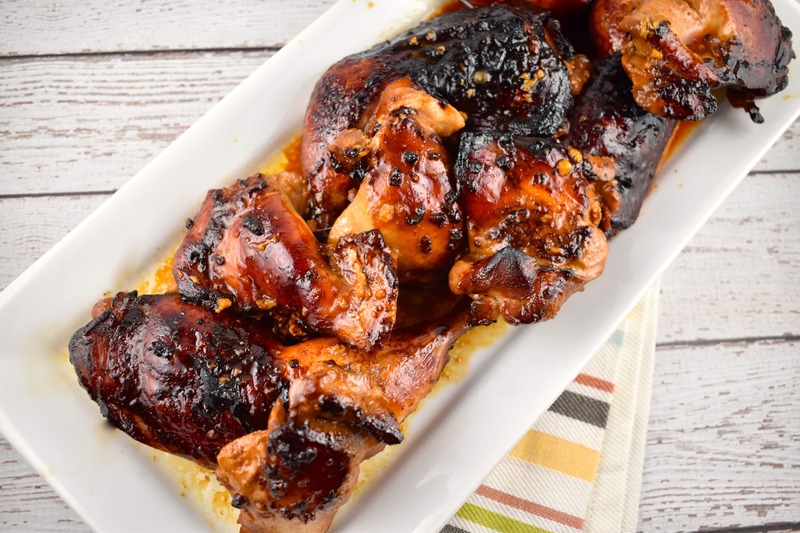 Tender, juicy chicken thighs roasted to sweet and salty perfection! Whisk together all ingredients, except the chicken, in a medium sized bowl. Add in the chicken, cover and marinate overnight. Place chicken in a baking dish, and roast, uncovered, for about 30 minutes, or until chicken is cooked through. Baste with pan juices every 10 minutes. Turn oven up to broil, and cook for 5 minutes more to get a nice browning crust on the chicken. Have you ever made this with chicken breasts? Binesless chicien breasts? My family doesn’t eat dark meat but it sounds delicious! What is the points conversion if I wanted to use boneless chicken breasts? There is no place on this recipe page for me to print it. in your browser, click File – Print. Love your recipe on Roasted Chicken w/honey. But could not find the Print button. Did I miss it and could you make it more visible.